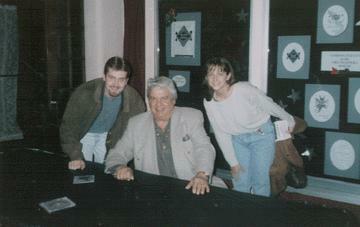 The Maynard Ferguson Tribute Page - Features - MF Encounters - I Met Maynard! Home Features Encounters I Met Maynard! The next night, Maynard played in Dubuque, Iowa, home of the Colts Drum and Bugle Corps. Of course, I was in the first row! That day, before I went to the concert, I printed up 50 or so little advertisements about this page. My plan was to talk to Ed Sargent before the show and ask him if I could leave the leaflets on the table next to the T-shirts, CDs, and itinerary info. About 20 minutes before the show, I found Ed and introduced myself. He recognized me from the night before and was extremely receptive. He said that leaving my advertisements out would be cool, and he gave me his email address. He told me that I could email him if I ever needed any info (tour dates, etc...). We talked for a while about my page and the people who have found my page (MF's daughter, former band members such as Rich Szabo and Christian Jacob, etc). After we chatted for a few minutes, Ed said, "So, do you wanna go down and meet Maynard?" I was like, "Of course!!! Can I get my camera?" He said that would be fine, so I grabbed my camera and my fiancé', and went back to get Ed. He took us down into the creepy basement of the old opera house that MF was playing in that night, and we walked through the big room where all of the band members were hanging out. We walked through pretty quickly, so I didn't see much, but I do remember Tom Garling buzzing in his mouthpiece. We went back to MF's dressing area, and Ed told us to wait in the hall while he got Maynard. Just as Ed went in, Big Bop Nouveau trumpeter Scott Englebright came around the corner wearing a dress that he found in the prop room. 4 or 5 other band members were following him saying things like "We gotta show the boss!". They walked into MF's dressing room, and one of them said, "Hey Boss, we've got a new girl in the band!" Just then, a huge burst of laughter that could only have been MF's flew out of the dressing room. "It's you," Maynard told him. After the laughter had subsided, Maynard and Ed came out, and Ed introduced us. I was completely nervous, so I just started stammering on about my page. Ed seemed really interested in my page, and was very excited when I told him that I had had over 2000 hits. I told Maynard that I had enjoyed the show in Sioux City the night before, and he said, "You know, you can ask us anything, but if you ask us where we were last night, or where we're going tomorrow we totally space out!" We talked for a few minutes, and then Maynard put his arms around my fiancé' and me while Ed took our picture. I shook Maynard's hand and we went upstairs to see the show. MF played an incredible show, that easily blew away the show from the night before. MF played Caravan in place of Manteca, but the finale was the real highlight. Someone that MF knew requested that MF play the hit medley! It was incredible, and for those of you unfamiliar with the medley, it ends with MF and the band playing "Hey Jude" in the aisles! MF walked into the audience shaking hands, and when he got to me he gave me the "I know you" point! 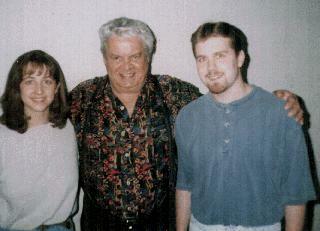 After the show, I waited in the lobby for Maynard and passed the time talking to Ed Sargent. Ed is an amazingly nice guy, who seems to be Maynard's greatest fan. We discussed our mutual frustration that so much of MF's great stuff (can you say Live at Jimmy's?) is unavailable. We talked a little about the album "It's My Time", which we both like, but MF isn't crazy about, according to Ed. Just as Ed mentioned that they could take a look at my page on the tour bus via their laptop, MF came out dressed to the hilt to sign autographs. 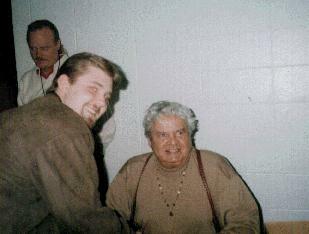 I waited to be the very last person again, and when I walked up, Maynard said, "I know that guy! It's...Keller?" I was astonished that he remember my name, and I said, "Yeah..Matt." "Matt," he repeated as he signed my CD cover (I brought the newly reissued Verve Jazz Masters disc). He ended up writing "Maynard Ferguson to Matt Keller. Cyber thanks! Say hello to Christian and Wilder!" Christian and Wilder are of course MF's son-in-law and daughter. We got another picture with MF and as we were leaving, MF asked my fiancé' "Are you real or are you something that Matt made up on the Internet?" It was a bizarre question, no doubt stemming from movies like "Virtuosity," but MF ripped into another laughing session that is so characteristic of his jolly personality. As we left, we were in a daze...neither of us were expecting that kind of experience. It was an amazing weekend that I will never forget, and I will be forever grateful to Ed for giving us that opportunity to meet MF, and to both MF and Ed for being unbelievably receptive and friendly.